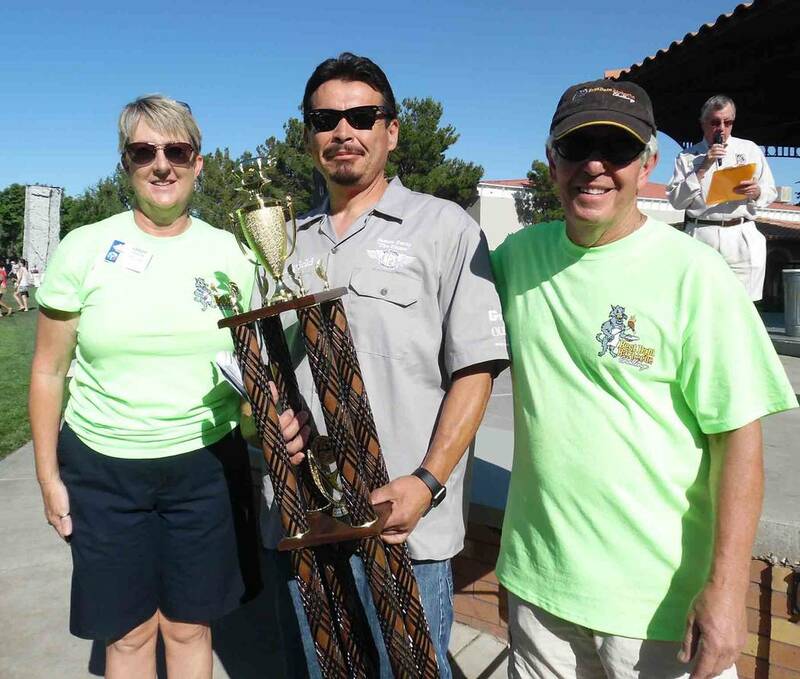 For the second year in a row, Big Poppa Smokers of Coachella, California, was named the Grand Champion of the Best Dam Barbecue Challenge held Saturday in Bicentennial Park. Hali Bernstein Saylor/Boulder City Review James "The Flame" Perez of Big Poppa Smokers of Coachella, California, was presented with the Grand Championship trophy by the Rev. Sandy Johnson, incoming president of the Rotary Club of Boulder City, and Dr. George Rosenbaum, the club's longest-serving member, at the conclusion of the Best Dam Barbecue Challenge on Saturday. The competitive barbecue team also took the top prize last year. Celia Shortt Goodyear/Boulder City Review Sterling Smith, pitmaster of Loot N' Booty BBQ, prepares his pork shoulder for the judges at the Best Dam Barbecue Challenge on Saturday. This year was Smith's fourth time at the challenge. 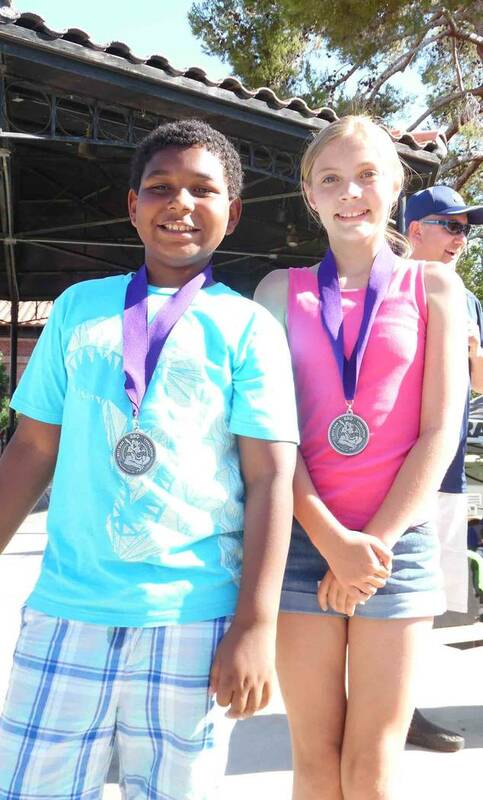 Hali Bernstein Saylor/Boulder City Review Tyson Blackmore of Las Vegas and Zoey Curtis of Boulder City won the KidsQue competition in the 6-12 and 13-18 age divisions, respectively, during the Best Dam Barbecue Challenge on Saturday. Celia Shortt Goodyear/Boulder City Review Boulder City Police Detective Todd Huff, left, and Sgt. 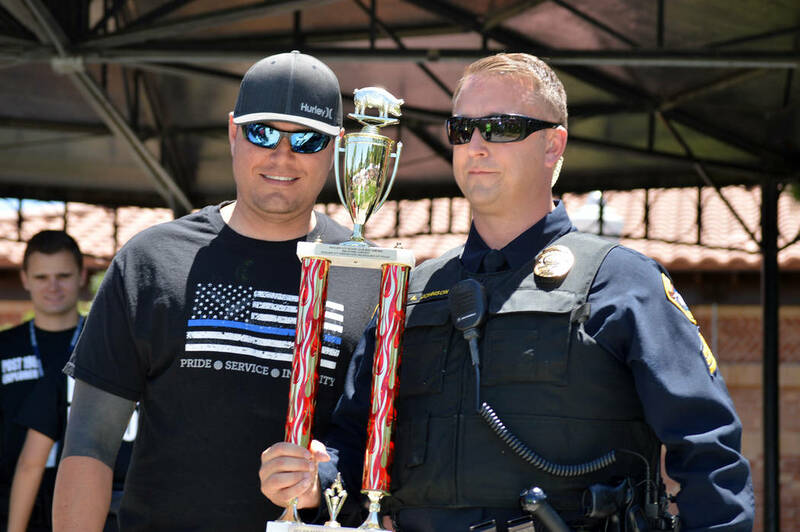 Aaron Johnson celebrate the department's first rib-eating contest win in six years. Celia Shortt Goodyear/Boulder City Review Irain Pacheco competes in the KidsQue competition at the 13th annual Best Dam Barbecue Challenge on Saturday. 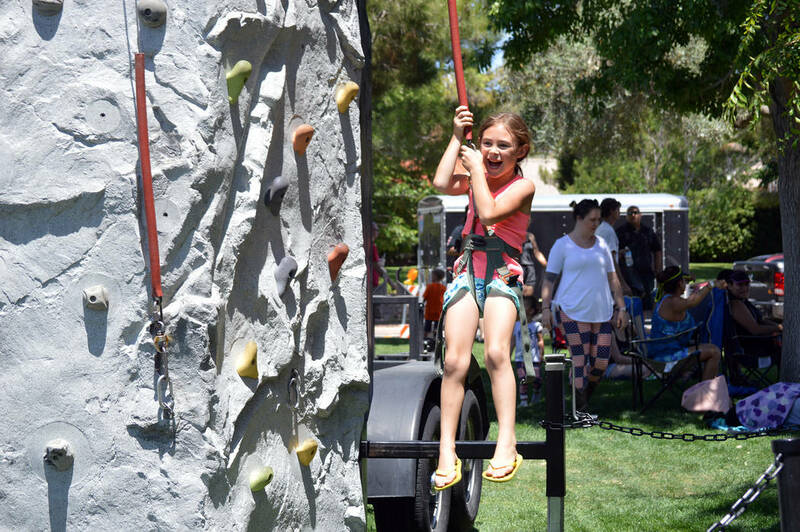 Celia Shortt Goodyear/Boulder City Review Savannah Challis enjoys the climbing wall on Saturday. Hali Bernstein Saylor/Boulder City Review Ribs were judged on appearance, taste and tenderness by certified Kansas City Barbeque Society judges during the annual Best Dam Barbecue Challenge presented by the Rotary Club of Boulder City on Saturday. 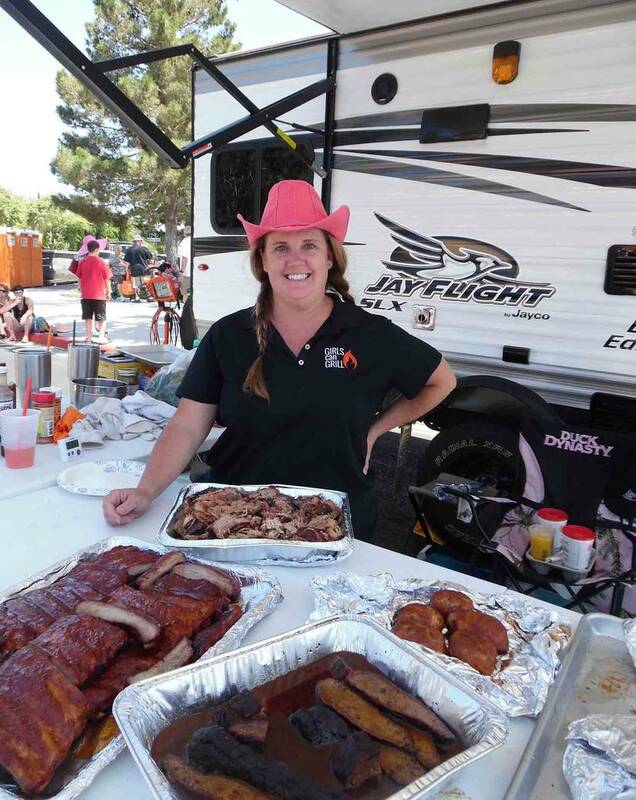 Hali Bernstein Saylor/Boulder City Review Christie Vanover of Girls Can Grill was the first female head cook to compete at the Best Dam Barbecue Challenge presented by the Rotary Club of Boulder City. She competed in all four categories, and came in the top 12 with her Wagu brisket. It was her first competitive barbecue event. Celia Shortt Goodyear/Boulder City Review Boulder City firefighter Nigel Walton eats his ribs as fast as he can during the rib-eating contest at the Best Dam Barbecue Challenge on Saturday. 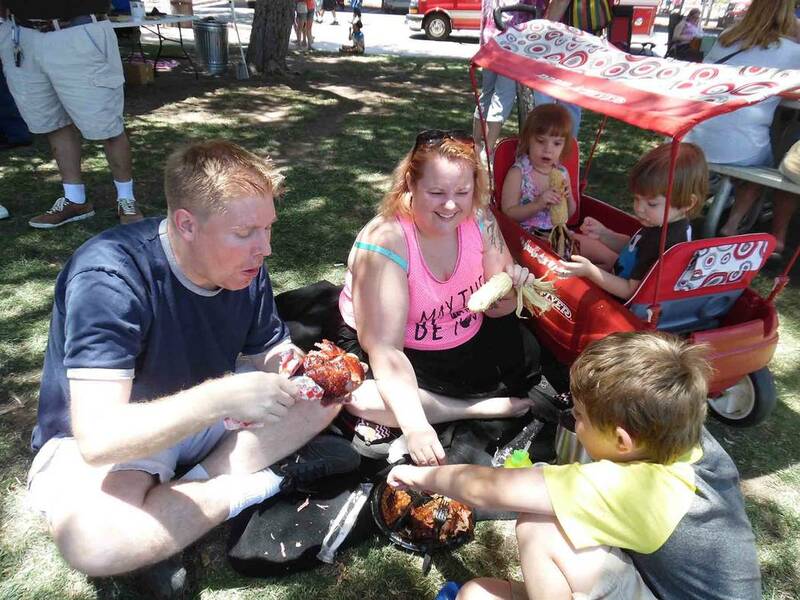 Hali Bernstein Saylor/Boulder City Review John and Amanda Campbell of Henderson, along with their children William, lower right, and twins Juliette and James, sampled some barbecued items offered during the Best Dam Barbecue Challenge presented by the Rotary Club of Boulder City on Saturday. Hali Bernstein Saylor/Boulder City Review Vendors sold their wares from Christy's Marketplace during the Best Dam Barbecue Challenge on Saturday. 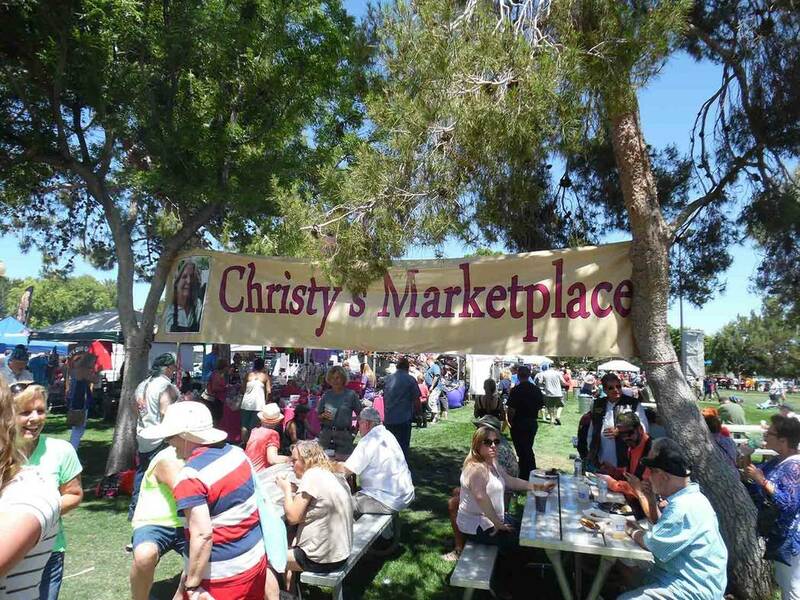 The new name for the vendors' area honors Christy Springgate-Hill, former event organizer and longtime member of the sponsor Rotary Club of Boulder City; she died in October 2016 after battling liver cancer. The award-winning barbecue team also won the chicken category. Hickory and Spice BBQ of Tustin, California, was the reserve grand champion. It also placed first in the pork division. 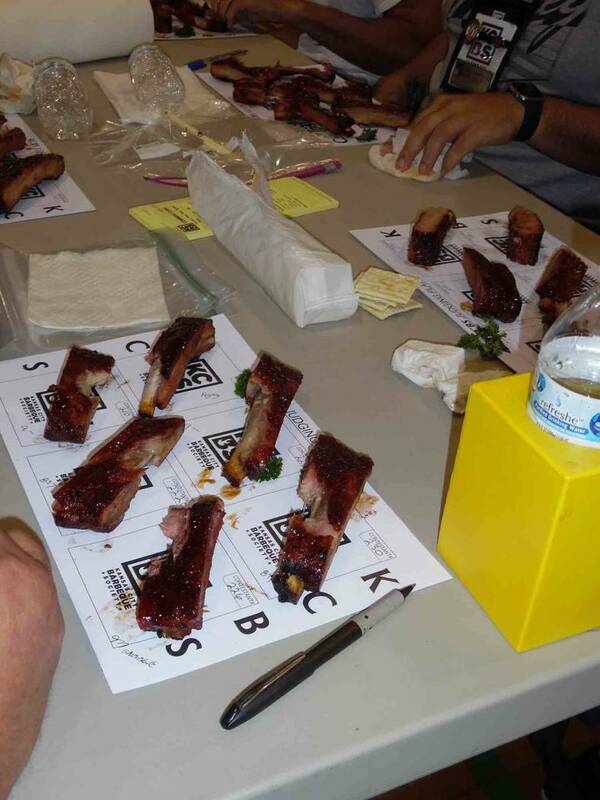 Mar-B-Que’s BBQ of Banning, California, took the top prize in the pork ribs competition, and ZZYZX Bar.B.Q. of Claremont, California, was the best in brisket. Presented by the Rotary Club of Boulder City, the 13th annual event attracted 37 competitors, including two from Kansas. The competitors split $12,000 in cash prizes. “Boulder City’s been very good to me,” said Sterling Ball of Big Poppa Smokers, which ranked third overall nationwide last year. 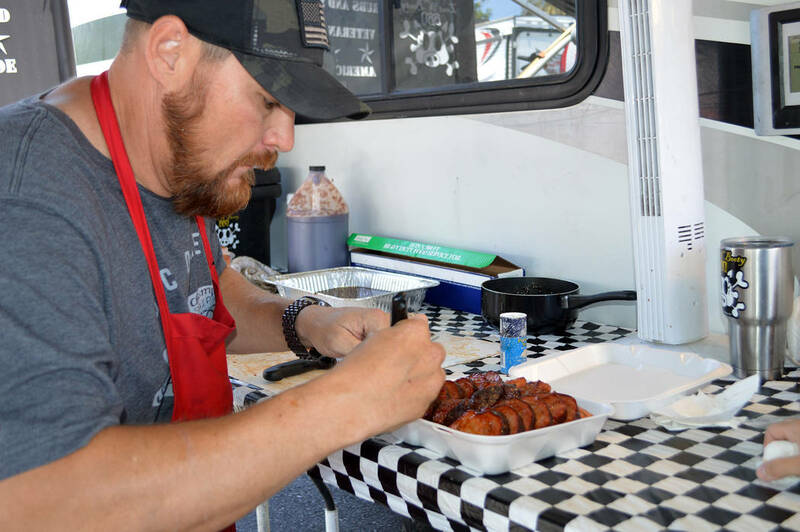 Ball said they participate in about 25 contests each year in nine states and enjoy the Best Dam Barbecue Challenge because of the people, community, accompanying car show, entertainment and vendors’ village. “Everything about Boulder City is perfect,” Ball said, noting that the only way he won’t return for next year’s competition is if he isn’t alive. “As I said on my Facebook page, it’s my favorite contest. The contest is sanctioned by the Kansas City Barbeque Society, which was represented by Kelly MacIntosh of San Diego. He said his job was to ensure that all the rules and procedures were followed by the judges and competitive teams. Each of the four divisions — ribs, pork, chicken and brisket — are judged on appearance, taste and tenderness, he said. Regarding appearance, MacIntosh said judges look to see how appealing and appetizing each entry is. “It’s ‘Wow, I can’t wait to eat this’ or ‘Wow, do I have to eat this?’ ” he said. Generally, each judge is given six entries to consider, with all of the judges’ scores compiled to create final results. MacIntosh said the Boulder City event is one of the most popular among competitions — of about 500 each year — because of the accompanying events for families. “It’s not just cooking,” he said. It’s also popular among judges. Myra Davis, who coordinated the judging for the Rotary club, said the competition is well-respected by the barbecue society. 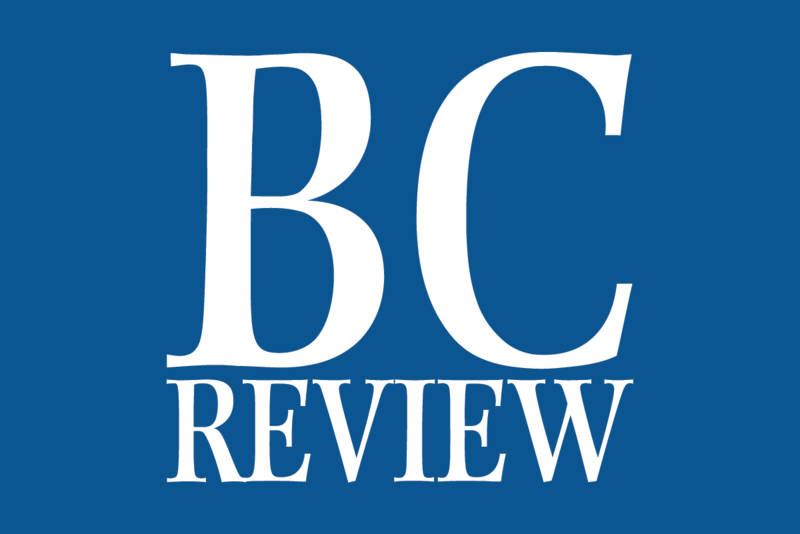 “In less than two weeks we had more than 50 certified judges apply for our event,” she said. First-time competitor Christie Vanover of Girls Can Grill said she had been practicing for nine months prior to the event. Author of a blog that encourages women to cook (and spokesperson for Lake Mead National Recreation Area), she said the biggest challenge was timing — there was 30 minutes between the turn-in time for each division. Placing 12th in brisket with a Wagyu entry, she said she was happy to hear her named called as results were announced. The Rev. Sandy Johnson, incoming president for the Rotary club and event organizer, estimated that between 8,000 and 10,000 people attended the two-day festival. 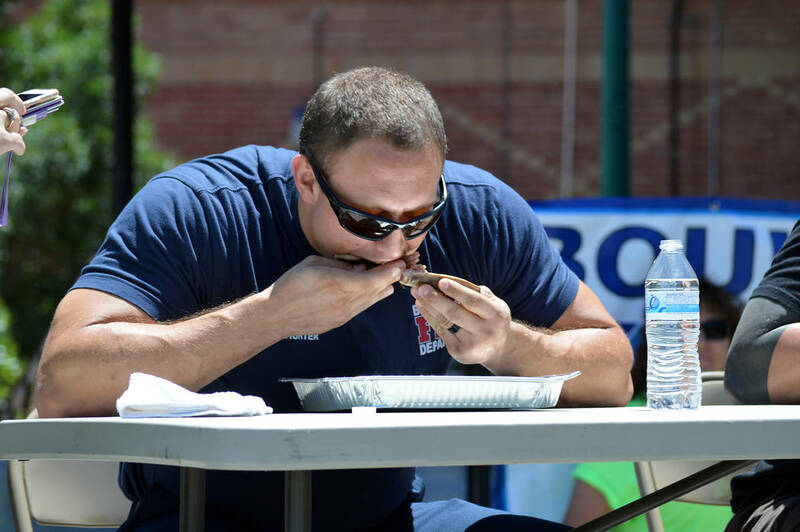 Among the highlights was the annual rib-eating contest that pitted members of the city police department against the fire department. After six years of losing to the fire department, the police officers were victorious. “After 12 months of intensive training, the reward at the end was victory,” said Sgt. Aaron Johnson, with his tongue firmly planted in his cheek. He said he visited Fox Smokehouse BBQ weekly to train for the contest. Fox donated the ribs for the contest. 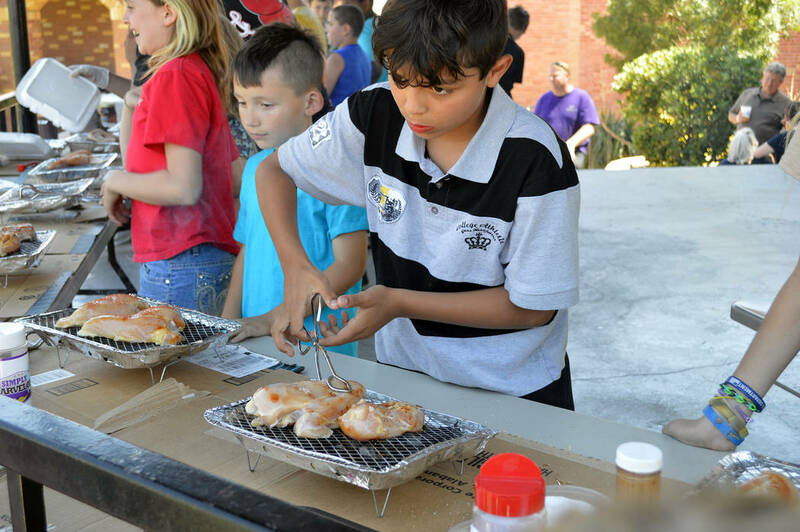 In addition to the competition featuring professional and amateur barbecue teams, the challenge included the KidsQue contest for children 6-18. Each child was given two chicken breasts and a grill for the event and they were responsible for their own seasonings and sauces. Tyson Blackmore of Las Vegas won the 6-12 age division, and Zoey Curtis of Boulder City won the 13-18 age division. They received $100 and a medal for their efforts.